SSV have a number of solutions that enable brands and event managers to benefit commercially from the use of our screens and services. View our introduction video and further info below. The sale of ad space and branding both as onscreen video and as physical surround to screens enables brands to directly associate themselves with events in the most visible and dynamic way, and for event managers to derive income from the onscreen and space around the screens. SSV have delivered high-visibility and creative branding options to virtually all major brands at a wide variety of events. We develop creative branding options with clients and sponsors to maximize the impact of brands at high-profile event. We integrate other elements such as mobile apps, call-to-action prompts and other highly innovative mechanics which ensure that advertisers and sponsors have the best possible impact at major events. 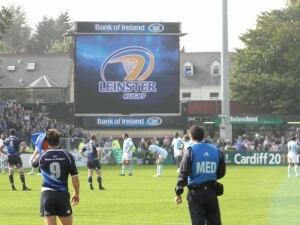 From long-term media and commercial options in sports events / matches such as Leinster & Munster Rugby, Horse Racing and major music festivals / concerts and events to public events and LED permanent installations. We also handle commercials on one-off events such as Dublin’s Women’s Mini Marathon, Solheim Cup and Drive-In Movies / Outdoor Movies events, SSV offer high-impact, branding opportunities to all brands at all major events. Ratecards, advertising packages and marketing information available on all events in EU / UK and Ireland.